It’s common knowledge that the United States is miles behind other developed countries in STEM (science, technology, engineering, and math) education, and that our economy suffers from, as Bill Gates has put it, “a severe shortfall of scientists and engineers with expertise to develop the next generation of breakthroughs.” And we also know that the humanities are in a downward slide, in part because they’ve been eclipsed by the dire need to focus on STEM. In the towers of higher education and the annals of our culture, we debate which discipline needs our hand-wringing the most. 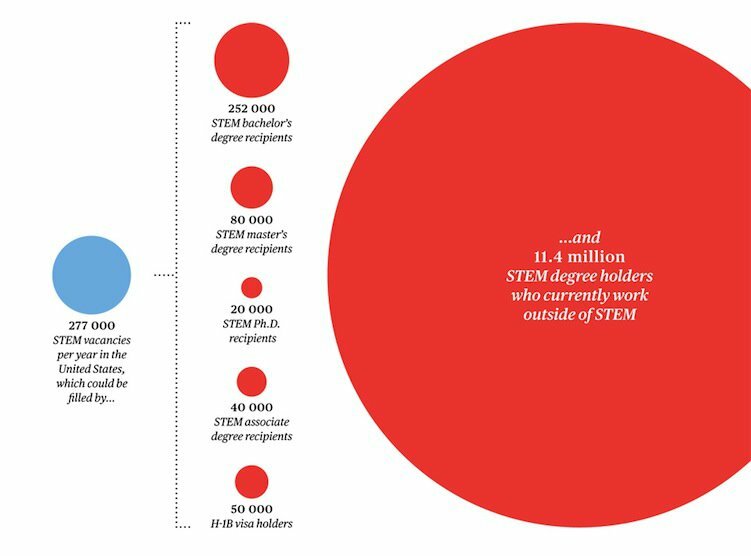 If a recent feature in the Institute of Electrical and Electronics Engineers’ magazine, Spectrum, is to be believed, there's no debate to be had: “The STEM Crisis Is a Myth” advances a convincing case that the U.S. is graduating more than enough scientists and mathematicians to satisfy the demands of its workforce. If this is true, it undermines the arms-race rhetoric pouring out of universities—and, more importantly, out of the federal government—about STEM education. In a speech this April, President Barack Obama said our future depends on “lifting up these subjects for the respect that they deserve,” and his proposed 2014 budget pledged another $3.1 billion to STEM schooling. If the sciences are not “in crisis,” but are in fact doing just fine, it begs the question: Why are we spending so much to revive them? Companies would rather not pay STEM professionals high salaries with lavish benefits, offer them training on the job, or guarantee them decades of stable employment. So having an oversupply of workers, whether domestically educated or imported, is to their benefit. It gives employers a larger pool from which they can pick the “best and the brightest,” and it helps keep wages in check. No less an authority than Alan Greenspan, former chairman of the Federal Reserve, said as much when in 2007 he advocated boosting the number of skilled immigrants entering the United States so as to “suppress” the wages of their U.S. counterparts, which he considered too high. But that effort to “keep wages in check” is eating up a lot of the federal funding pie—to the detriment of the humanities. Charette reports, “the U.S. government spends more than U.S. $3 billion each year on 209 STEM-related initiatives overseen by 13 federal agencies. That’s about $100 for every U.S. student beyond primary school.” According to “The Heart of the Matter,” a report on the woeful state of the humanities released by the American Academy of Arts & Sciences this summer, the government pays for well over 50 percent of the scientific research done in universities, and close to 75 percent in some disciplines. 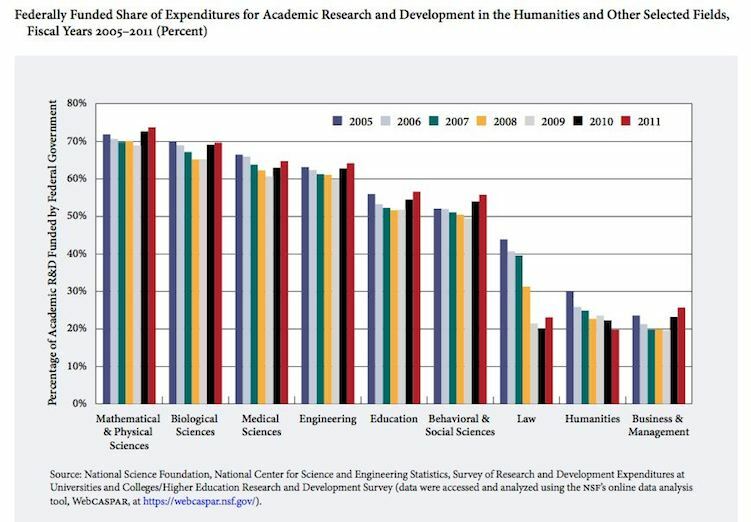 Meanwhile, the humanities are fronting all but 20 percent of their own costs. The funding Obama apportions for the National Endowments for the Arts and Humanities has been creeping up in recent years, but is microscopic compared to STEM dollars; his proposed 2014 budget raises each endowment’s budget by around $200,000, to $145.5 million each. 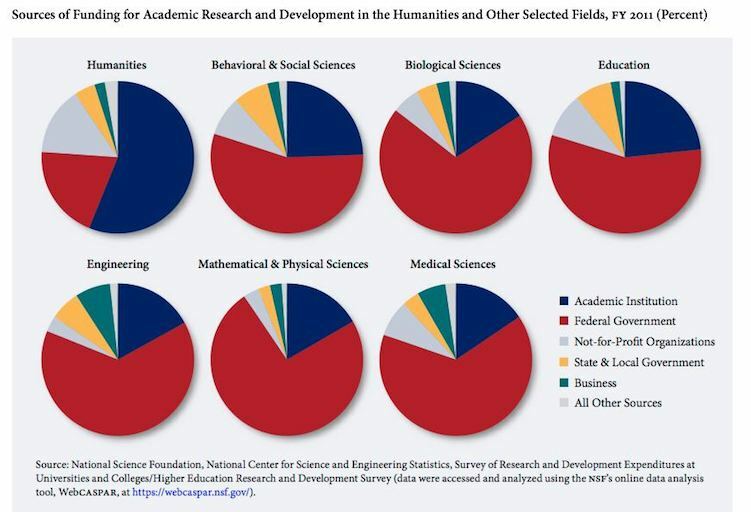 Of course, it's easy to argue that the humanities don’t need as much funding as the sciences. Literary close reading, for instance, doesn’t require as many gadgets and gizmos as computer programming, or open-heart surgery; but scholars need money to live on just as much as scientists do. Worse, the imbalance in spending is so heavy that it's creating a skewed perception of value, too. This past winter, Florida Governor Rick Scott proposed charging college students more for humanities majors while keeping tuition low for quantitative majors that his task force considered “high-skill, high-wage, high-demand.” Obama’s fiscal policy implies what the task force in Florida was bold enough to say: that STEM fields are a good “return on investment,” while arts and letters are not. This doesn’t have to be an either-or proposition. Charette signs off with the somewhat utopian hope that, since “many children born today are likely to live to be 100 and to have not just one distinct career but two or three by the time they retire at 80 … we should figure out how to make all children literate in the sciences, technology, and the arts to give them the best foundation to pursue a career and then transition to new ones.” It’s the kind of generalist entreaty that one usually hears from the humanities camp. It almost sounds like the beginnings of a truce.